DIY, Hardware , Garden, Decoration, Construction services. Eurobrico is a consolidated quote and an international reference. 3 to the 5 October of 2018. Easy, Economic, Professional, cost-effective. Exhibitors have the advantages to participate in EUROBRICO, Economic and easy to organize stand. Here you will find all the documentation necessary to assess their exposure. Send us the completed application, to formalize their participation. How to apply for the entry form? To exhibit in Eurobrico you must send us the participation application form duly completed and signed, enclosing proof of payment of the registration fee and the 50% the amount of the requested m.
You can find the participation form by clicking here or contact us by phone + 34 963 86 11 68. 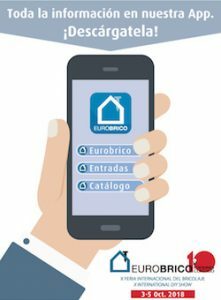 How to participate easily in EUROBRICO? How do invite your customers? From the contest we will send you invitations online with your company logo to make them reach out to their customers. To ensure that your participation in Eurobrico is a success, We recommend that you perform the following actions. Click here to see them. How to have more brand visibility? How to get the passes of Mount? In the office of assemblies located in the Pavilion 6 bis, access by the main building of Feria Valencia. The exhibiting company may withdraw the passes of Mount once it is aware of the payments. See calendar and Assembly schedules, here. How to get the spotlight and parking cards? In the office of Treasury located in the Pavilion 6 bis, access by the main building of Feria Valencia. The exhibiting firm may withdraw Exhibitor passes and a free parking card once it is aware of the payments. If you need more than one parking card, You can request them through the services folder. See calendar and schedule of Exhibitor, here. How many Exhibitor cards correspond? Cards will be delivered one time is aware of the payments. How to get visa to go to Eurobrico?